In your business you will have haters. Now haters will be in probably two forms. One. Competitors. Who hate what you do. And second one, customers who think they hate you. So let me explain. So let’s do the customers first. Firstly sometimes, customers, clients, whatever, whichever way you call them, will be having a bad day. Now it is nothing to do with anything that you have done. Sometimes people have pressures. I mean at the time when I am recording this is around the end of the tax year here in the UK. All sorts of things. Who knows? And it can effect some of their decisions and their mood on the day. The customers are humans just the same as the rest of us. And sometimes you may get the bunt of that. They may be ready to complain. Have you ever been in that position where you just, it’s all boiling up and someone does something wrong. And you just have a right all go at them that you wouldn’t normally. Well that can happen. So first of all, you have to take the assumption that it wasn’t your fault. That’s very important. Now of course if they are complaining violently about something that was your fault, where it did wrong, then it is your fault. You have to accept responsibility and this is essential. 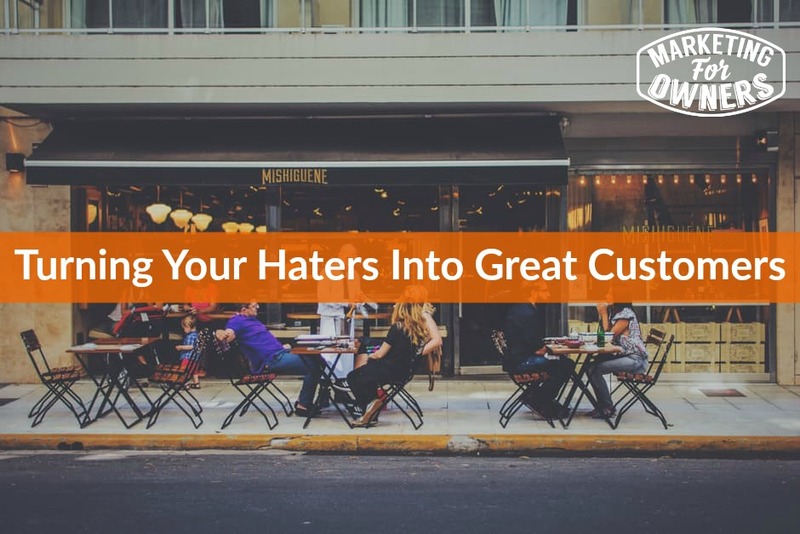 This is how you turn haters into lifelong customers, in both respects. For instance, in our case we do next day delivery. Quite often the carriers, our delivery people way out of our control. Once they’ve got the goods will mess them up, drop them, loose them, send them to the wrong delivery address. Send them to the delivery address. Put them with a neighbor, and not put a card through the door. Deliver them a day late. All kinds of things. It’s not our fault. But hey, when the customer needed it that day, yes it’s our fault. Yes we take responsibilities so when that customer complains, we will do anything to make them feel better. Now we have spent money in some way, shape or form whether it’s in time, in some way we have spent money to acquire that person’s business. If, say they spent 50 pounds and we make 25 pounds profit on that job. Then if it would have cost an amount of money to get their business. Say it cost 10 pounds. Had they not bought anything, we will be 10 pounds down. So at this point, we can afford to just give them, give them stuff back and we still wouldn’t be that far out in our loss. I mean for us we get over a 100 orders a day. So we take the thought that if we’ve got one customer upset, if we let them keep the goods and gave them all their money back. We can afford that. Now how do you think that customer’s going to feel? Are they going to feel angry? Or are they going to start to turn around? And what’s going to happen when at a dinner party, at a group when somebody complains about some company, about Telephone Company or something like that? What do you think this guy is going to say? Or this lady? They are going to say, ‘Hey I tell you what I once bought some fire extinguishers or whatever it is from some company and they do all this and I found up one wrong, you know what they did. Not only did they let me keep it but they gave me all my money back. Isn’t that fantastic? Now what kind of service is that? Why don’t other people act like that?’ Etc. etc. You may not believe this but that tells me that you’ve never tried it. You are accustomed to standard, what I would call British Customer Service. Which may be ok. But it’s certainly not American. It’s certainly not Canadian. It’s certainly not Australian. And it’s certainly not South African. The quality of service you get in other countries outside of Europe is so immeasurably higher. It’s genuine. And it’s heartfelt. And it’s all down to company culture. That’s another thing. But I suggest you try it. If you, say if you’ve got a turnover of 100,000 dollars, pounds, whatever. If this, if one customer is worth a hundred pounds, what would it harm you to give them their money back. What are you thinking? Pride, no you don’t want to give in. Is that pride? Think about it. I think it might be. I think that is 7th of 7 deadly sins. Something like that. So just think about it. Because you are going to convert the customer into a lover. And they are going to be a lover not hater. Now that’s a good thing. Because that hater could know lot of people. And when they tweet out, and they tell about it, wouldn’t you just be surprised to find out how many people retweet that? And then suddenly you are featured in an article, in a magazine about bad customer service. How did it all go wrong? Wouldn’t you like to try and avoid it? When competitors complain about what you do. All you need to do is contact them, be brave and offer to go and meet them. Offer to go and have a coffee. Buy them a coffee. Buy them a lunch. Meet them. Explain what you do. Explain how your company works. And say ‘I am sorry but this in my field, this is the way business is going’ and explain things. You will convert that person to be a lover. You know not like that. But they’ll like you. And then when this comes up. When your company gets discussed or badmouthed at other places, you’ll find your friend; who is no longer a competitor. Sorry but you have to put yourself out. Remember when you are trying to get customers, you spend money on advertising, or you spend money and your time to get them. So why not spend money in giving free goods or gifts as compensation? And why not spend your time in speaking to them to turn them around? Yeah, that’s how it works. Think about it. Honestly. It’s really really good. If you look at, if you can find our ratings online, you’ll find every single badmouth thing. We apologized to people and we accept responsibility. And we tell them that we have since phoned them and done whatever they asked. And you’ll be amazed how many people go back in and change the rating. And says, ‘I did originally give them, but we’ve changed this to 5 stars because I’ve never had customer service like that.’ This works my friends. Anyway, just a quick one on podcast. It is Drive Time Podcast recommendation. 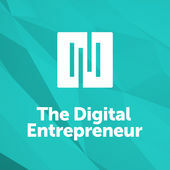 And today I am going to recommend The Digital Entrepreneur. Now this is one from Brian Clarke’s Studio from Rain Maker FM, but just look up The Digital Entrepreneur. You know there’s all sorts of guests on. Now I actually think he’s, he may have stopped recording these from December in 2016. However the archive is still there. And the podcast is the gift that keeps giving. Because the information is not going out of fashion. He’s fantastic. He gets great guests. They give great interviews. Well worth a listen. No matter who’s on it. Go back through the archive, you will love it. Promise. Anyway, and don’t forget tomorrow is Ones to Watch Interview. It’s a surprise. You’ll like it. Don’t miss the Fridays. Okay see you soon.